As one of the largest cruise ships to date, Oasis of the Seas delivers plenty of onboard activities for cruisers of all ages. In fact, there is so much Oasis of the Seas entertainment that trying to fit everything in during your cruise could be a challenge. 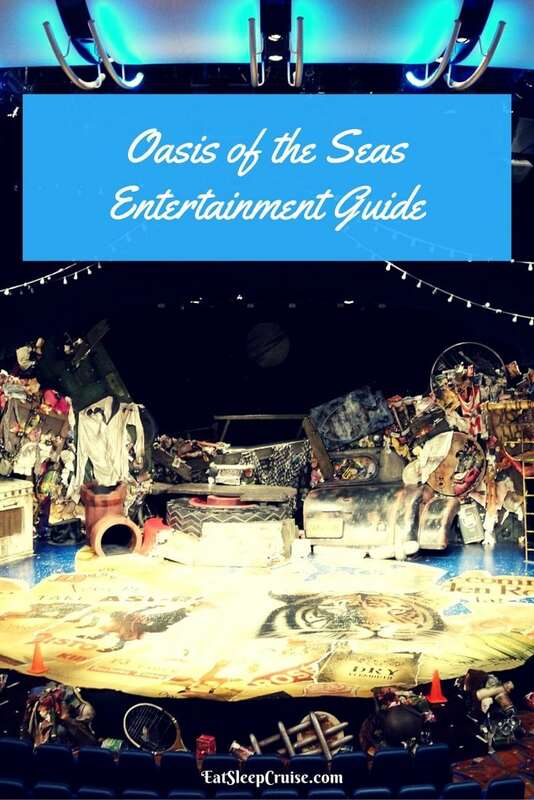 That is why we have put together this Oasis of the Seas Entertainment Guide. Learn more about all of the one of a kind nighttime entertainment options and start planning now so you never miss a show! Included in the Oasis of the Seas Entertainment line up are 6 shows that are available for pre-booking. These include Oasis of Dreams, CATS, Comedy Show, Headliner Show, Frozen in Time, and Come Fly with Me. It is recommended that you reserve these shows as they will fill up quickly, especially the Comedy Show. Reservations can be made prior to boarding using the online cruise planner (approximately 90 days prior to sailing) or immediately upon boarding the ship. Only those with reservations will be scanned into the shows approximately 30-45 minutes prior to showtime. If you do not have a reservation, you will need to wait in a standby line and are not guaranteed admission. This full length Broadway production show is offered in the Opal Theater on Oasis of the Seas on Day 1, Day 2, and Day 7 of the cruise. Evening time slots are available on Day 1 and Day 2, and a matinee showing is available on Day 7. This award winning musical with music by Andrew Lloyd Webber runs a full 2.5 hours complete with an intermission. Join the Jellicle Cats as they compete to be reborn. With larger than life characters including Old Deuteronomy, Mr. Mistoffelees, and Grizabella, this performance is sure to mesmerize you. Even though the show is a bit long, be sure to stick around until the end; you won’t be disappointed with these amazing singers and dancers. This one of a kind diving show takes place outside in the Aqua Theater located on the Boardwalk and is offered on Day 1, Day 3, and Day 4 of the cruise at 7:30 and 9:30pm. This show is weather permitting and may be cancelled and/or altered due to weather conditions. Official run time should be close to 50 minutes, but our performance was cut short due to rain. 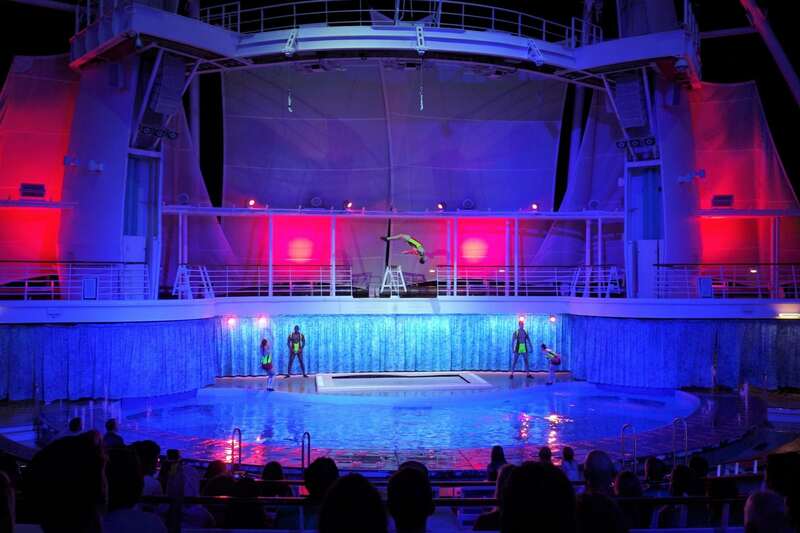 In Oasis of Dreams, you will witness Olympic class divers, aerial acrobatic feats, and synchronized swimmers perform in the deepest pool at sea. The precision and athleticism of these performers is breathtaking, making this a must see show. 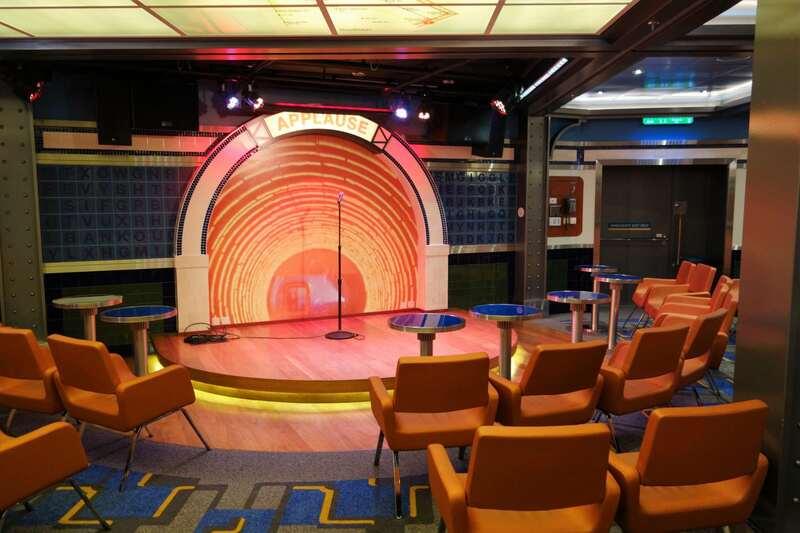 The small, intimate Comedy LIVE venue hosts the Adult Comedy show most nights of the cruise at 9pm, 10:30pm, and 12 am. These shows are virtually the same every night, so you are only allowed one reservation. Due to the limited seating capacity in Comedy LIVE, these reservations do book up quickly, typically before even boarding the ship, so it is highly recommended that you pre-book online using your cruise planner. This approximately 50 minute show features a quick set by the emcee followed by longer sets from 2 comedians. On our cruise, we laughed along to Robbie Printz and Andrew Kennedy. We personally found Robbie Printz a bit funnier. If you are unable to get a reservation or want to see the show again, you can wait in the standby line which can get quite long. Of note, we waited in this line 3 nights and only got in once. If all else fails, there is a similar show that does not require a reservation that is held in the Opal Theater on the last evening of the cruise. The Headliner act will vary from cruise to cruise, but the Headliner show is usually offered on Day 3 at 8:30pm and Day 4 at 8:30 and 10:30pm in the Opal Theater. 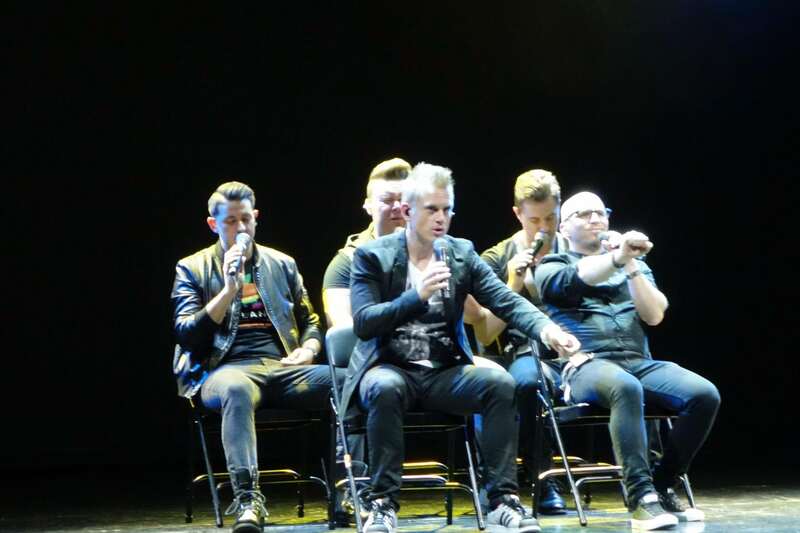 On our recent Oasis of the Seas cruise, the headliner act was VoicePlay. This five member a capella group puts on a one of a kind performance with only their voices. The songs, sound effects, and musical instruments are all created from the group’s vocal range. Spanning top hits, classics, and Broadway hits, this show combines musical talent, a touch of humor, and a whole lot of voice. If VoicePlay is part of your Oasis of the Seas entertainment line-up, we definitely recommend checking out their show. 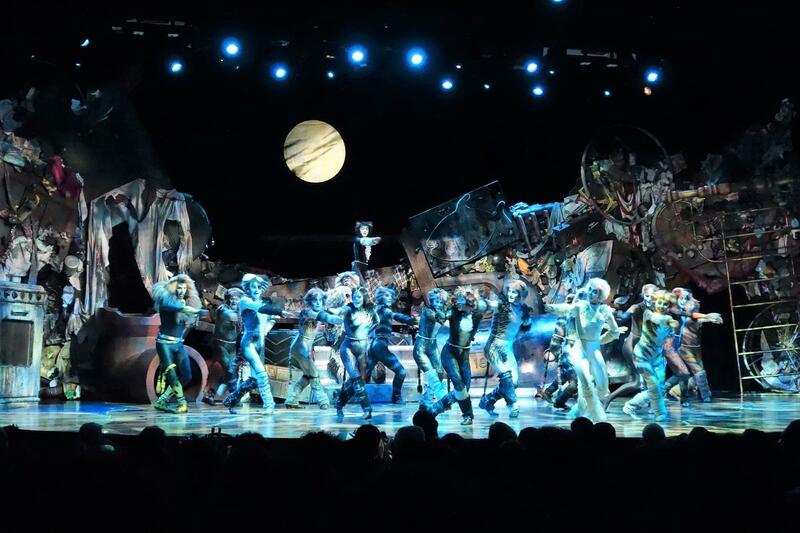 This Royal Caribbean production show is offered in the Opal Theater during the later part of the cruise, on Day 5 at 7:30pm and Day 6 at 8 and 10 pm. Witness talented singers and dancers, amazing aerial acrobatics, and high tech stage props during this ode to flight. Showcasing interactive digital backgrounds for a multi-dimensional and imaginative experience, you are invited to “Come Fly with Me” on a journey of fun, fantasy, and escape. Given the use of technology and the impressive aerial feats, this was arguably our favorite show from the Oasis of the Seas entertainment line-up. 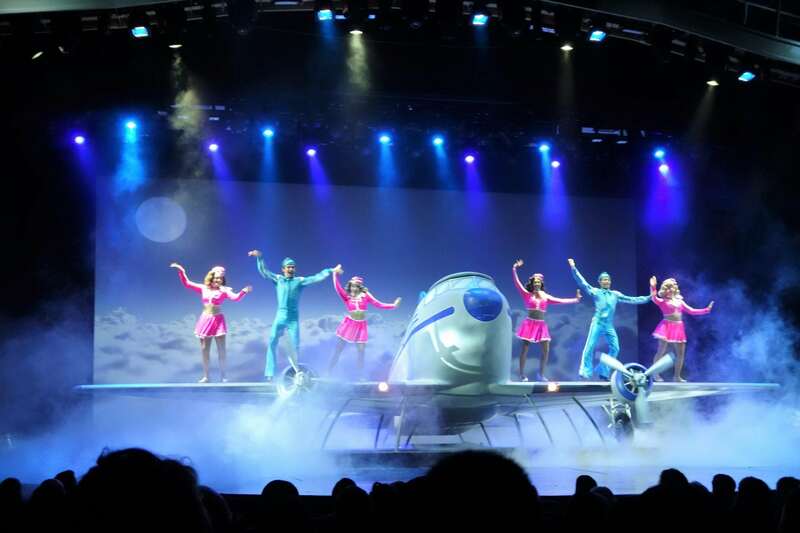 Come Fly with Me is a unique, must see show, so be sure to secure your reservations. 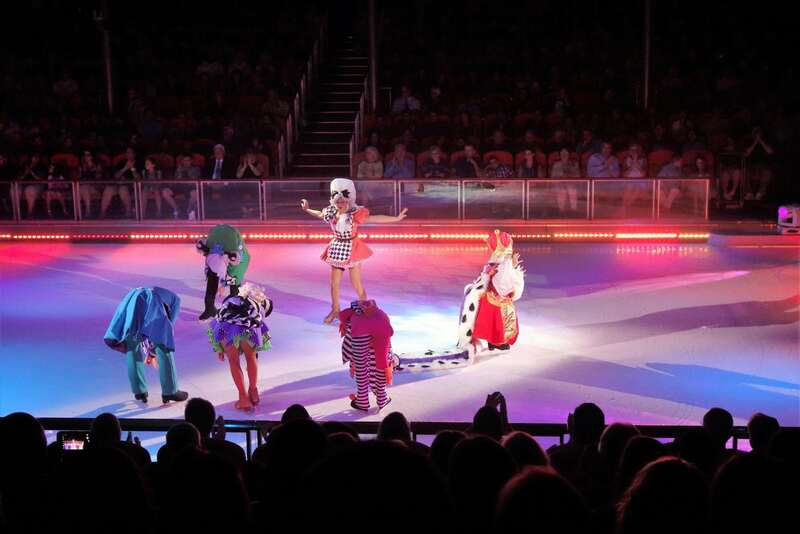 This ice show takes place in Studio B on Day 2 at 7 and 9:30pm, Day 5 at 8:30pm and 10:45pm, and Day 7 at 3 and 5pm. Frozen in Time features classic fairy tales from Hans Christian Andersen including “The Emperor’s New Clothes”, “The Snow Queen”, “The Ugly Duckling”, “The Little Mermaid”, and “The Red Shoes”. With a cast of talented skaters, impressive costumes, and well choreographed moves, this ice show is on par with other Royal Caribbean ships. When you think of how amazing it is that these talented skaters can perform flawlessly on a moving ship, there is no reason why you shouldn’t attend this show. 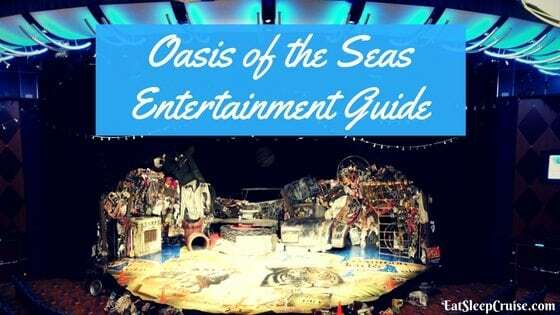 Even those the 6 shows listed above are the only Oasis of the Seas entertainment that you are able to reserve, rest assured that there is plenty of other nighttime entertainment for you to enjoy. From live music in most bars and lounges to plenty of game shows, trivia, dance classes, outdoor movies, karaoke, and more. Some of the cruise staples include: Majority Rules (Day 2 at 9 pm), Love and Marriage Game Show (Day 3 at 10:30pm), 80’s Flashback Dance Party (Day 4 at 10pm), Battle of the Sexes Game Show (Day 4 at 11pm), 70’s Disco Party (Day 5 at 10pm), White Party (Day 6 at 9:45pm), The Quest (Day 6 at 11pm), and the Move it, Move it! Parade (Day 7 at 7:45pm). Note: Show times listed in this post were accurate for our August 27, 2016 Western Caribbean cruise but are subject to change at any time. Show times may also vary for different itineraries. Do check your online cruise planner for availability on your cruise. 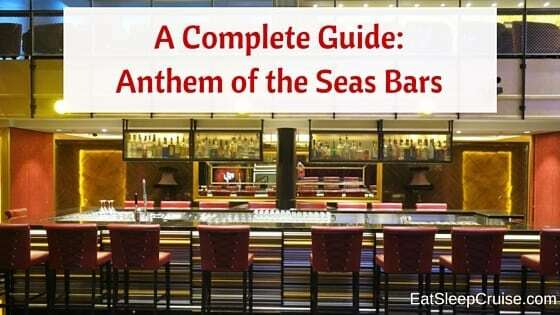 Have you sailed on Oasis of the Seas? 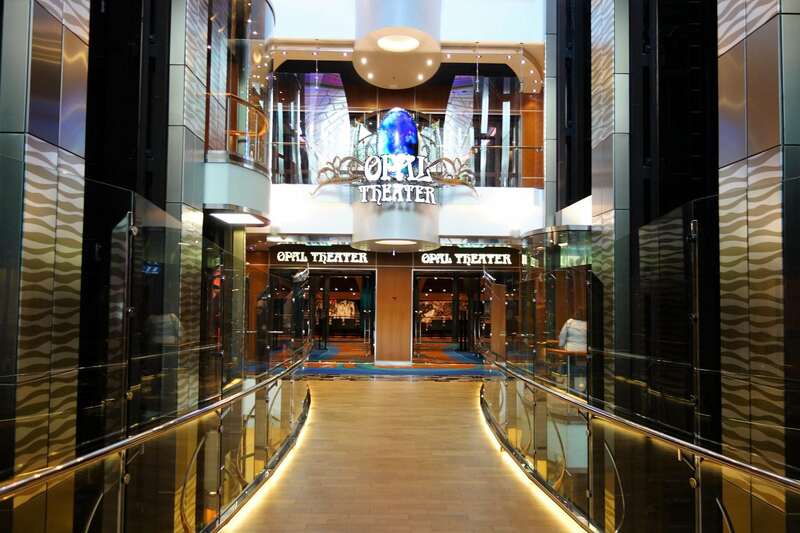 What were your favorites among the Oasis of the Seas Entertainment? Drop us an anchor below to let us know what shows you love on a cruise.